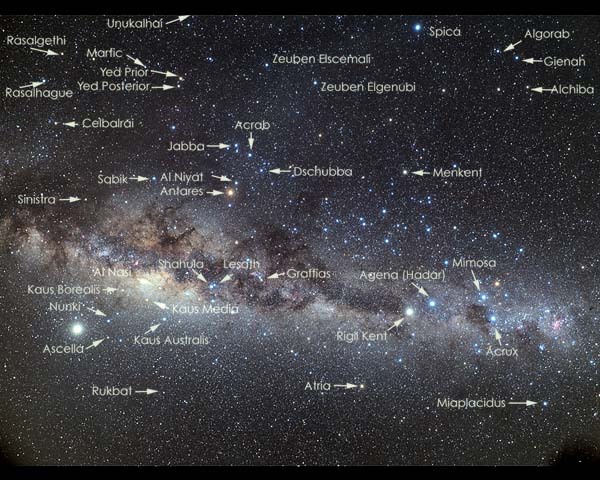 This remarkable photograph covers much of the southern Milky Way from Aquila to Carina and Vela, from the south celestial pole (marked SCP) to the southern fringes of Hercules, 15 degrees north of the celestial equator. 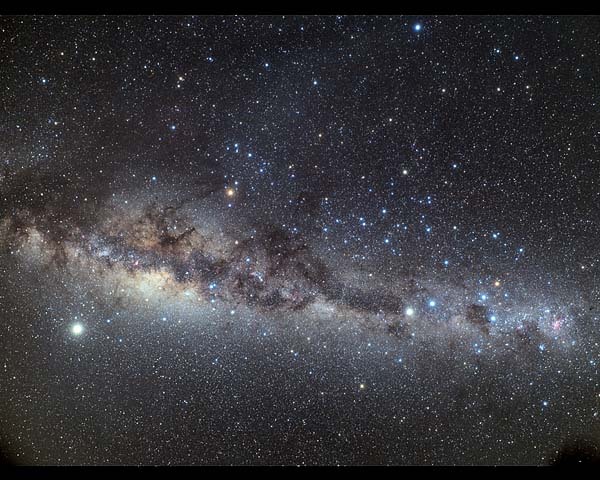 It also encompasses the brightest parts of the Milky Way in Sagittarius, where we look towards the centre of the Galaxy, and Crux and Carina, where we look along an outer spiral arm. Throughout, the Milky Way is divided by an irregular dust lane that extends northwards into Scorpuis and Ophiuchus. The constellations outlines indicate that the image shows 20 or more complete constellations and substantial parts of many more of the 88 currently recognised. Also shown is the ecliptic, the path of the sun and planets across the sky, which passes through the zodiacal constellations. When this photograph was taken, Jupiter was in the sothern Milky Way and is by far the brightest object on the ecliptic. The main named stars in the photograph are shown here.